Pentel of America, Ltd. and the Pancreatic Cancer Action Network (PANCAN) have joined forces to increase awareness and raise funds to support research and advocacy to fight pancreatic cancer. 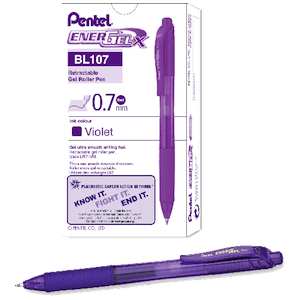 All packs and dozen boxes of violet EnerGel-X liquid gel pens now prominently feature the PANCAN logo and Vision of Progress to double the pancreatic cancer survival rate by 2020. For each package sold, Pentel will donate 5¢ to the organization. Plus, Pentel will be donating violet EnerGel-X pens to the organization for use during training seminars and community outreach events. Last year, when PANCAN volunteers noticed that Pentel was supporting breast cancer charities through the sale of their pink and purple pens, they took to Pentel’s Facebook page and pointed out that purple was the color of PANCAN and lobbied the brand to support the charity with their purple pen. PANCAN corporate development staff noticed this volunteer-led social media rally and reached out to Pentel’s national marketing office. One year later, this violet pen campaign was born. Talk about seeing the writing on the wall! Thanks to Donna DeDario of PANCAN for sharing a behind-the-scenes look at this great partnership.